A fine and very rare dagger exhibiting conflicting formal and decorative characteristics. While generally evoking the well-known Yemeni janbiyah dagger, close scrutiny reveals an unexpected origin. The hilt a single section of elephant, brilliantly carved and undercut, depicting an armed warrior on horseback hunting a rhinoceros among huge trees, behind which the massive casements of windows set in the stone walls of a castle are visible. The handwrought blade emulates the Yemeni form: broad at the forte, sharply curved, continuously tapering and double edged, with the addition of a distinctive bisected rectangular central rib. The velvet-covered wooden scabbard with applied galloon, mounted in silver, the locket finely filigreed with a Christian cross, the chape with engraved motifs showing Persian influence, the finial of Arab thum form. The Kingdom of Georgia was declared a Christian nation by King Mirian III in 337 c.e. Various other religions, notable Zoroastrianism, persisted until the 7th century. Its nearest Christian neighbors were Byzantium and Armenia, with whom it generally enjoyed good relations. After the seventh century, Georgia was further bounded by Muslim states; it was invaded many times in its long history.In 1783, devastating wars with Persia and the Ottoman Empire, followed by constant raids by the Muslim mountaineers of Daghestan and Chechnia, compelled King Erekle (or Hercules) to sign a peace treaty with Imperial Russia; a few years later, this treaty was used by Tsar Paul I to annex the Kingdom of Georgia entirely. While sovereignty had been lost by the Georgian royal families and contenders, life in Georgia generally improved. Large number of Russian nobles who served as high-ranking officers were posted to the capital, Tiflis, and with them came their retinues, including many European artists, craftsman and literary figures of the early 19th century. European architecture and culture took root in Tiflis and flourished; an opera house, theaters, palaces and European-style hotels sprang up, along with Russian, French and German schools, and the highest ranking Georgian families emulated Russian costume and manners at receptions, balls and audiences. Their children learned Russian, French, German and even English in schools and their princes became officers in the Imperial Russian Army. The richest traveled to St. Petersburg, Berlin, Paris and London. Many noted literary and artistic figures, among them Alexander Dumas, visited Tiflis during the 19th century. This European cultural overlay had, by the 1830s, kindled a predictable reaction; a sense of Georgian nationalism. This manifested itself in an entirely cultural context during the period under discussion, and was evident primarily through literature and costume. Legends which for centuries had been related via oral tradition began to emerge in books and journals; the literati performed lengthy epic poems at receptions and artistic salons sprang up. Women often wore European ball gowns in town while reverting to traditional Caucasian dress at home in their ancestral fortresses. Noble Georgian males now accoutered in elaborate Imperial uniforms, began to express their cultural heritage in the weapons they carried. These included distinctive sabers, daggers and firearms which the Russian officers openly admired and often acquired. The Tiflis Arms Bazaar itself was a microcosm of the new Georgia. In its streets lined with narrow stalls, observers report Russians, Germans, Frenchmen, Turks, Persians, Kubachins, Circassians, Armenians and Georgians all working side by side; the very nature of their proximity compelled an exchange of forms and motifs as they displayed their work for the examination and pleasure of their colleagues. It was in this multi-ethnic environment that a remarkable fusion of forms and motifs arose. The combination of Georgian nationalism, expressed through the language, its history and literature, and the remarkable renaissance in craftsmanship found in Tiflis from the 1820s – 1860s, provided some of the finest and most imaginative works in arms ever seen in Imperial Russia, which later led to a series of almost laughable misidentifications among collectors and museums, a condition which persists to the present. By examining the form, execution and literary works of the Georgian people, the dagger under consideration may be attributed with certainty to a Georgian master working in Tiflis between 1820 – 1850. The client who commissioned such a weapon would have been a member of the Georgian nobility. First, because the superior quality of its workmanship and materials would have made the cost prohibitive for any but the wealthiest patron, and secondly, the thorough knowledge and appreciation of the Georgian legend which this piece narrates suggests an individual of education and nationalist sympathies. Finally, the form of the dagger’s blade and mounts indicates a man who likely traveled extensively throughout the Middle East. Amiran, the Georgian hero, travels far and wide with his loyal retainers in search of battle and honor. While questing, Amiran meets a man dressed all in black who is mourning the death of his lord, Badri of Yemen. The man in black tells Amiran how Badri killed three knights in single combat to win the Daughter of the King of the Sea. Badri of Yemen and his warriors enter the Land of Beasts and slay lions, a rhinoceros, and a two -headed monster. Badri is ultimately killed and Amiran takes up the noble quest, making great and loyal friends. His travels include Persia, what is now Afghanistan, India, Khazaria and Arabia. In the end, after feats of daring and magical challenges which are the equal of the best-known Greek legends, Amiran becomes king and marries no less than three different princesses, thereby acquiring the kingdom of each as he goes. The knightly figure who opposes the rhino carved on the ivory grip is clearly identifiable as Badri of Yemen. 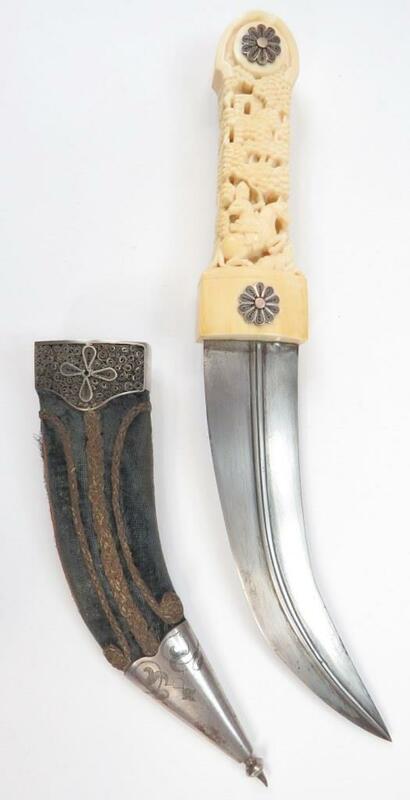 However, the patron who conceived this dagger and the master who crafted it have further and quite cleverly emphasized Badri’s origin by conforming the blade of the dagger’s legendary reference—though Georgian-made, it is of Yemeni janbiyah form. Yemeni blades are virtually always forged with a sharp central ridge—here, though the form precisely duplicates Yemeni work, the central rib of this example is raised though flat, and further subdivided by a narrow groove; characteristically Georgian treatments. Lot #444 is a unique example of the cosmopolitan palate of techniques and literary influences found amongst Tiflis armorers and their clients in the first half of the early 19th century.